Q: What is The Estates Samui and where is the project located? A: The Estates Samui is an exclusive collection of 14 villas situated on Laem Yai Bay on the island of Samui, in a secluded cove above a private beach adjacent to Four Seasons Resort Koh Samui, just 15 minutes from the airport. These Bill Bensley-designed masterpieces are crafted from the finest tropical hardwoods to exacting specifications and fuse traditional Southern Thai style with modern luxury. Each villa is exceptionally private, set on 1-2 rai of land amidst lush coconut groves, with 2-5 bedrooms offering breathtaking vistas of the Gulf of Thailand. Each villa also features a private infinity pool with large sundeck, sunken dining pavilion, spacious living and dining areas, state-of-the-art entertainment and technology, indoor-outdoor bathrooms, and your very own butler. Q: What are some of the facilities and services available to residents? A: Residents can access the extensive amenities of nearby Four Seasons Resort Koh Samui. This includes a wide range of luxurious facilities and services, including a fully-equipped fitness centre, tennis courts, library and reading room, a world-class spa, water sports amenities and some of the best beachside dining options in Thailand. Owners will also enjoy a world of five-star service, including all-day room service, bell attendant service, 24-hour telephone operator, cable television, 24-hour security, car parking and housekeeping. A: Construction is now complete. This means that buyers can take immediate possession, and more significantly, view the villa prior to purchase. Q: What ownership structure is available at The Estates Samui? 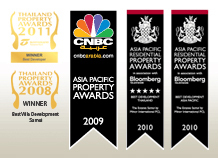 A: The Estates Samui offers both freehold and leasehold structures, depending on the eligibility of the purchaser. Under the present law, freehold ownership is available to Thai nationals or Thai registered companies. For non-residents, we provide 90-year leasehold ownership, comprising three successive 30-year terms. Through leasehold arrangements, non-residents can acquire a villa without the hassles of having to set up a Thai company (non-Thai nationals can only own up to 49% of a company, the remaining balance owned by Thais). Q: Are there charges related to freehold and leasehold registration? A: Yes, charges associated with the registration of both freehold and leasehold interests are payable to the Land Department. For freehold interest, the associated costs include transfer fee and stamp duty (approximately 1% of the appraisal price), while for leasehold interest, registration fee and stamp duty amount to 1.1% of the leasehold amount. Q: Can leasehold interest be assigned or converted to freehold interest? A: After registering the lease agreement at the Land Department, the purchaser will have unfettered rights to use the land in accordance with the terms and conditions of the lease agreement. Leasehold rights can be transferred to a third party but the new owner shall remain bound to the conditions and provisions stipulated in the initial lease agreement. An option clause to convert the property to freehold status during the term of the lease is included in the agreement, providing the Lessee is qualified under Thai law. The Lessee would be responsible for all taxes, legal and administrative costs associated with such conversion. Q: Is there a warranty offered by the developer? A: Yes, a one-year warranty on the main structural parts of the building, including piles, footing, slabs, roof structure and load-bearing walls is offered by the developer. Q: Are additions to the villas permitted? A: Our villas have been meticulously designed by architect Bill Bensley and construction was undertaken by Italian-Thai Development PCL., one of the leading contractors in the country. As such, we would like to maintain the consistency of our design, as well as the overall look and feel of the project. Any addition would detract from its original design and purpose. Q: Is there a rental programme offered to villa owners? A: Owners have the option of putting their whole villa or just a lock-off unit into the rental programme. The rental programme is a one-year contract with an option to renew. Q: Are there any restrictions on the use of villas if owners join the rental programme? A: Upon signing of the rental agreement, owners are asked to provide a schedule of when they want to use their villas over the next 12 months. Thus, owners are free to reside in the villa for as long as they like. Owners can always choose to back out of the programme with 90 days written notice, but any reservation made prior to the termination must be honoured. Q: How are rental revenues shared? A: Revenues received by the resort management are allocated to the owner (60%) and the resort operator (40%) after the expenses associated with marketing of the villa have been deducted. Q: Who is responsible for maintenance of The Estates Samui? A: The external area of the villas and common area facilities are managed by dedicated staff trained and supervised by the management team of Four Seasons Resort Koh Samui, ensuring the same superior standard of service. This includes general administration, landscaping maintenance, routine and preventive maintenance, general repairs, pest control, refuse collection, pool cleaning and 24-hour security. Q: What charges are owners responsible for? A: Owners are responsible for the payment of maintenance and management fees to properly maintain common area infrastructure and amenities. Owners are also responsible for specific individual charges such as electricity, water and sundries for their individual villa. A sinking fund contribution will also be required from owners for major infrastructure repairs and/or improvements.